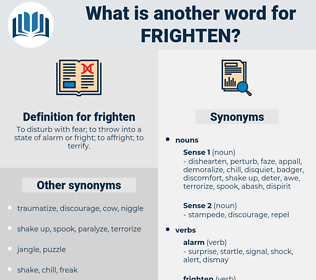 What is another word for frighten? To disturb with fear; to throw into a state of alarm or fright; to affright; to terrify. scared the pants off of. 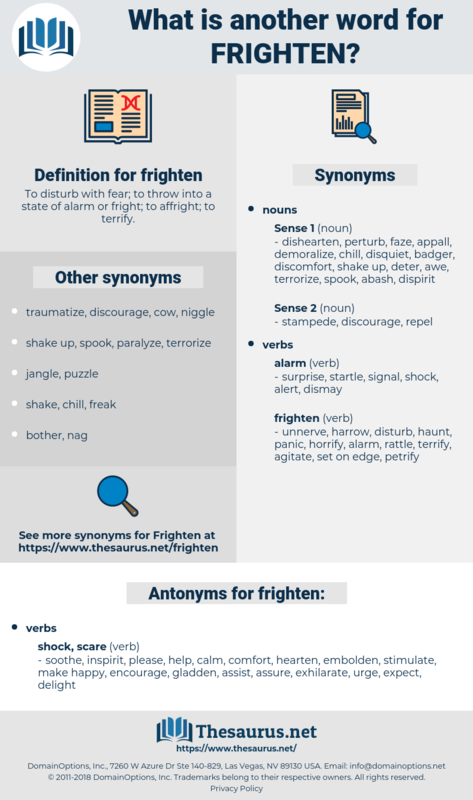 intimidate, startle, terrorise, deter, spook, threaten, fear, bully, alarm. soothe, inspirit, please, help, calm, comfort, hearten, embolden, stimulate, make happy, encourage, gladden, assist, assure, exhilarate, urge, expect, delight. Hugh, dear, you're safe now; please speak; please laugh; you frighten me more than anything - why is he so silent, Pete? Oh, you can't frighten me.